Need 1940s clothing or 1950s outfits for girls & guys? We’ve got your swing and rockabilly looks, from head to toe! Our clothes and accessories are crazy, man, crazy and include many original deadstock, never worn finds! We’ve got lots more cool clothes at our Asbury Park, NJ store. Our stock changes too often to feature all items on this site, but we always carry a great selection of 1940s and 1950s outfits: swinging dresses, super skirts, blouses, and sweaters! Satin jackets, poodle skirts and cute dresses with crinolines are what you need for your 50s girl look! And don’t forget the ankle socks that gives the bobby soxers their name, and a pair of saddle shoes. 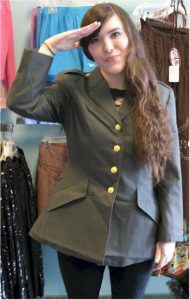 Army jackets, sailor dresses, and seamed stockings to take you back to the World War II years! The guys’ stuff! 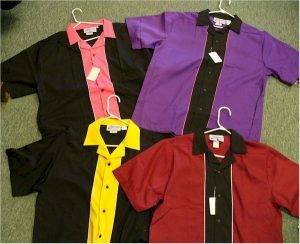 Bowling shirts, pants, fedoras and more for that rockabilly or rat pack look.